January is the month for getting our lives in order right!? Well here are a few of the things I have been stocking up on to get myself organised. Write stuff: I love this planner from one of my fave stationery places online the Fox and Star, and these little notebooks from the lovely Oh No Rachio, Sticky notes, as you may know are my bag and this yummy set from Paperchase are not only stylish but essential. Label stuff: It's all very well tidying up but if you don't make a note of where it all goes how on earth are you going to find it mid April when you need it? Labels don't have to be dull either, these heart shaped ones from Mail Box Happiness on Etsy are fun and cute but you can never go wrong with Kraft tags, these ones from Wilkos are perfect. Along with these neon tags from Knot and Bow, that will bring a splash of colour to the dullest of filing systems. File stuff: If you want to jazz up your filing system whilst you are at it, think about this acrylic drawer unit from Ryman, or these yummy wire trays from another fave of mine Papermash. This colourful filing boxes from H&M would be a great disguise for all your boring paperwork if you prefer to keep those bills hidden away until absolutely necessary. How are you getting yourself organised this year? 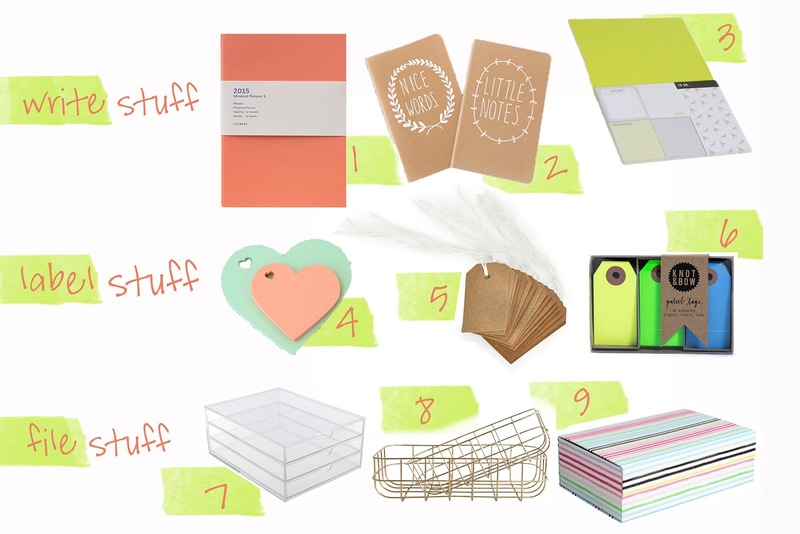 Are you a naturally organised person like our H or do you need more help like me? Let us know in the comments and thank you to all of you who filled in our survey last week, the results have been very helpful in our blog planning for this year, so hopefully we can bring you even more of what you love from us in 2015.